Do you subscribe to Dogs Today yet? Why not? It works out very much cheaper than buying it in the shops. If you still need convincing you can buy an issue post free via our website (UK only for postage free, sorry - Europe and ROW prices display on Worldpay but for paypal we'll have to email you the cost). And you don't need to pay a year in advance - you can do a standing order in three issue slugs. There are so many different ways of saving money and now that we've moved our mailing house (this issue onwards) you should get your editions in the post well before the magazine hits the shelves. The advance copies of our much anticipated September issue will shortly be arriving at our office and if you order now we can get one posted out to you ultra early! Phone 01276 858880 during office hours or click here. September's issue contains 132 pages of unmissable features. Many more pages than any other dog magazine. We remember Lennox and take an in-depth look at what happened and why with comments from all the main players, including contributions from Victoria Stilwell, Sarah Fisher and David Ryan. I talk to prosecution witness Peter Tallack and give Lemmings, Lies and a Videotape the chance to talk. Behaviour specialist, vet Kendal Shepherd assesses BSL, and you send us your special Lennox tributes from all around the world. I can't believe you'll read more in depth coverage of this case anywhere. 53 homeless dogs are searching for forever and foster homes, might one or two or them become part of your family? We’ve got updates on those dogs previously featured who have found love. And remember we're always looking for more dogs to feature in this section - click here for how to be included. Behaviourists Karen Wild and Chirag Patel consider what decisions you should make before welcome a new canine family member. Sarah Whitehead tells us why we should be aiming for training gold. Peter Neville helps soon-to-be parents and their collie prepare to welcome their bundle of joy. Anna Osborne guarantees you’ve got a gambling addict living in your home. Jemima Harrison asks if neutering is really just a load of balls. Part three of Gina Stokes’s guide to doggie dancing. Richard Allport keeps you flea-free the natural way. It’s a family affair for Terry Doe this month as he sorts out doggie problems for his elders. Scientists say you and your dog are more alike thank you think. Rachael Millar asks if stray dogs about become laboratory fodder? We celebrate 30 years of Hearing Dogs with Bruce Fogle. This month we give you the lowdown on the Finnish Lapphund. Could they be the breed for you? Laura Lee urges you to make friends with fellow doggie people. You tell us your dog’s favourite supplements and we answer readers’ queries in our Think Tank. Meet the brave children who went from running in front of a car to avoid a dog, to stroking one, in just one hour. Lots of goodies to be won, and oh-so-chic pet boutiques to browse. And to top it all off, we meet Hollywood starlet Krysten Ritter and Downton Abbey favourite Lesley Nichol and their dogs. September's issue is on sale Thursday 9 August in the shops. 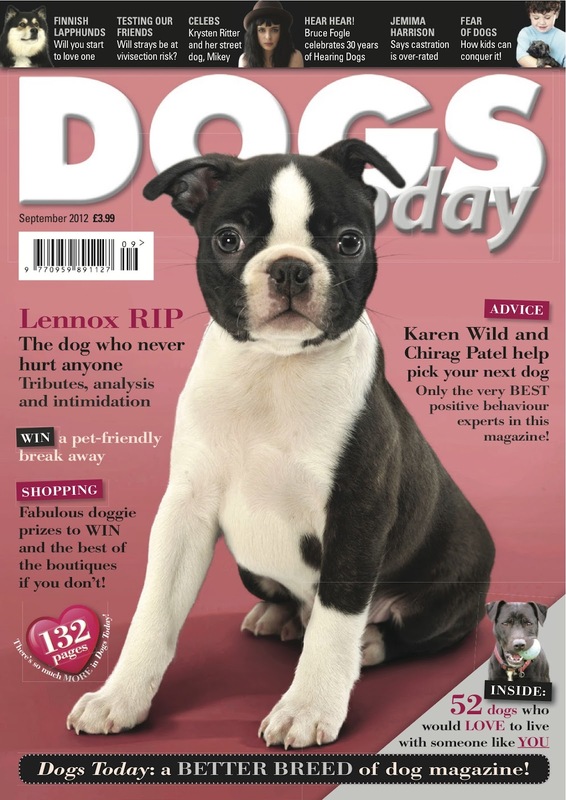 To subscribe in an ever growing number of formats and start saving money, visit http://www.dogstodaymagazine.co.uk. Do let us know what you think of this edition. We always want to hear your views.